Like many of you, I was programmed by Vets, dog food companies and the media to feed a prepackaged, processed dog food - kibble and tinned with some scraps from the left over human meals. I have had dogs all of my life and all, up until 15 years ago, were fed this way. They had lots of visits to the vets for skin problems, teeth cleaning and other assorted but undefined health issues. This is what was the norm in animal care. Basically, we were in the hands of the Vets and their opinions. Wow, did I find out just how badly I was treating my best friends. They did not have to suffer itchy skin; they did not have to be pumped full of drugs; they did not need to have their teeth scraped and they did not need to have to put up with the awful food they were getting in their plates. 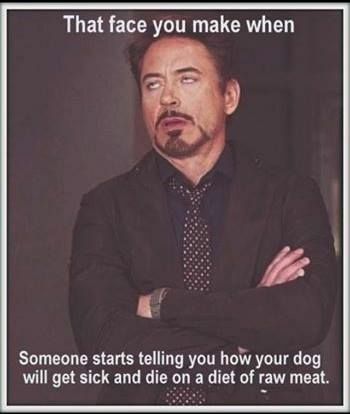 So to the real facts on feeding a raw diet for the lifelong health of your dogs and cats - yes don't forget your feline friends. They too suffer from all the health issues their canine cousins do. I am not an expert or scientist when it comes to feeding raw, I just know that what I do works for my animals. My animals do have white strong teeth; do have lustrous healthy coats; do have firm low smelling stools that turn into chalk quickly (if your stool collection is a little lax you will notice this transformation) and always have a healthy smile on their face with breath you can live with. Don’t hesitate to change your dogs diet. It won’t hurt them, it will save them and give them many more years of a happy, healthy life than anything that comes in a packet. My show dogs and pet dogs and felines are all fed the same food regardless of what job they are doing. Only the size of the bone and the quantity of the meat varies. I wish as a human I was as particular about what I eat as what I feed my dogs. Isabella is a 7 year old American Bulldog. They don’t have a particularly long life span and many die too early of health issues. As they are not a registered breed in Australia, no one is really interested in these facts. I am because it matters. Isabella is 38 kilos of solid muscle. Every part of her is hard to the touch. This is not because she is exercised or worked, it is because this is how they are genetically designed. I have however seen some ABs that were flabby and soft, with itchy skin, unhappy and unhealthy. I put this difference down entirely to a perfect diet, healthy lifestyle and happy environment. Recently Isabella had to have a cancer removed from her side, requiring an overnight stay at the Vets. I asked that while she was under anesthetic, that all her teeth, limbs, nails etc be inspected for any ware or damage that wasn’t readily seen in normal viewing. Most dogs will try to hide an injury or weakness so you won’t always be aware that something is amiss. Some dogs hide things better than others. My vet announced when I collected her the next day that her teeth were strong and sound and so white that any fault would easily have shown; her gums were in wonderful condition; her nails were strong, and although a little arthritic with age, she was, as a 7 year old, equivalent to a 4 year old. This, in my opinion, is all due to feeding a raw diet. Sadly, Isabella died of bone cancer. It had naught to do with diet or lifestyle, it was just what happened. She will always be missed here at Kerris. Rather than me continue on here, I would like to redirect you to a website which has not only all the answers you need, but many more questions you haven’t even thought to ask. I do not personally know the owner of this website, have never met her, but what she has written is exactly what I wish I had been able to put on paper.